During my trip to the coast, I could not help but notice this beautiful sign (photo to the left) erected at many wildlife viewing areas. It's not a vulture, definitely not a hawk, can not be herons of any kind. If you bird at the right place, it would not take you long to find out what this bird is. Wood Stork (Mycteria americana) is the only stork breeds in North America (mainly in the coastal Georgia and Florida) and they are more popular in the central and south America. They are large wading birds and adult male can grow up to 46 inches (115 cm) tall with a wingspan of 72 inches ( or 180 cm) wide. They appear to be white when stand still and show blackish-grey at the edge of wings in flight. When I visited Harris Neck National Wildlife Refuge in the end of May, I saw this huge colony of Wood Storks literally occupied the entire Woody Pond. Wood Storks like to build nests on Cypress swamp and it could have up to 25 nests in one tree, and they are great companies to many other waders, such as herons, egrets, ibises, Anhingas and spoonbills. Most adult parents either guard the nests or constantly fly back and forth to find food for their young. During one breeding season, one family can consume over 400 lb ( or 181 Kg) of fish, frogs and insects. Their unique fishing technique is to catch prey by "touches"! 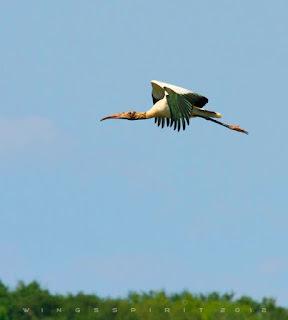 Stork opens its bill in water and waits for prey to pass by and snaps it in as quickly as 25 millisecond!! This special hunting ability allows them to forage at muddy areas where herons or other shorebirds could not easily get to. Both parents feed young. As new born grow bigger, parents will regurgitate food into the nest. one Wood Stork family can eat up to 400 lb of fish, frog and large insects. 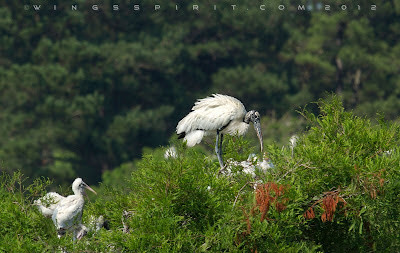 Wood Storks like to fly with vultures. It's an awesome visual experience to see these huge birds soar and glide low over my head and that reminds me of Archaeopteryx, a prehistoric bird of the Jurassic Period! Archaeopteryx (始祖鳥 in Chinese or Urvogel in German) means "original bird" or "first bird", appears to have wings, teeth and a bony tail based on the fossil evidence. But modern bird has evolved to have no teeth and a lighter jaw to be a better and faster flyer. 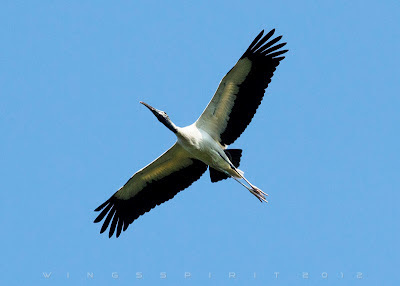 Wood Storks like to soar and glide with vultures. Click image to enlarge. As one can imagine with such a large colony, Woody Pond must be full of noise. Yes, but only the sound from hundreds of hungry chicks! One interesting fact later I learned is that storks are mute and produce no sound due to lack of syrinx, the vocal organ of a bird. They mate for life and communicate through bill-clattering and aerial display. That really makes me pondering if language is that important at all. If wildlife can find a way to express their love and affection, what about an intelligent species like human?